Summary: As the youngest of four, Nina Hadley has always had her big brothers telling her what to do. 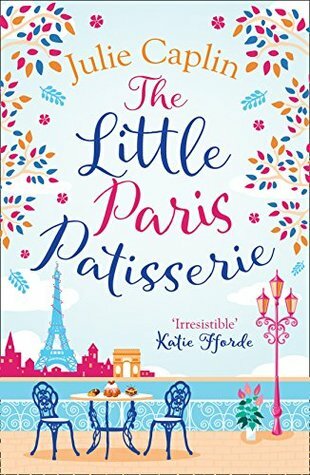 So, when she’s given the chance to move to Paris and help run a patisserie course, she can’t say au revoir quick enough! There’s just one problem: high-flying chef Sebastian Finlay is the owner of the patisserie. He’s also her brother Nick’s best friend – and the man she has secretly been in love with since forever. I received this novel from netgalley as an exchange for an honest review. Now, normally I would divide this into two sections, the characters and the plot, then I change to start with what I expect from the books and what I really got. But then, I decide that I want to write the review of the book as a whole. We have here, Nina, not Nina Zenik obviously, who is already in the age, where we usually called mid-life crisis, who didn’t have a job for the time being because of circumstances. Now, Nina was a very blessed woman, her family was there for her, if ever she failed and she’s living in comfort, if I may say. But Nina thought she wanted more, so when an opportunity came in the form of Sebastian, not the butler from a certain manga, she thought she had to grab it. The story revolves in Nina’s point of view, something I quite enjoy while sipping my peppermint tea (which I’m also doing right now). Somehow, I could relate to Nina, her indecision, her struggles, well yeah I’m mad, but I also have to struggle so the madness won’t consume me otherwise you’ll see the Jabberwock instead. Opps, let’s talk something else then. Now, Nina’s characters are not the most favorite one ever, but it’s so real. I would applaud her for being able to withhold herself facing the grumpy Sebastian. If it were me, I would probably do something to his hat! Too bad he didn’t wear any hat, maybe I’ll do something with his clothes then. I was doubting whether I would enjoy this story or not as I was not a fan of romance, however, to my surprise, this book was not close to that. Sure, there’s romance, sure there’s this ‘aww’ scene that romantic people would go squealing, but to me, I enjoy the journey for Nina to find herself. To stand up for herself in front of her family, to just be Nina, but without her family. I know that family is important as important the cakes that have to be there for my afternoon tea party, but sometimes they could be too much. You know, if you have too much cakes, you could go puke too. Ah, speaking of cakes! Nina, who wants to try to be pastries have so many creativity that she doesn’t dare to share to Sebastian because she’s afraid of what he could tell her. But man, all those pastries she mad, the chocolate, the eclairs, everything sounds delicious. I wish that I could have those for my tea party. Sighs. Well, thanks to that, she manages to tell Sebastian of what that guy has been missing this whole time. Focusing only for his goal to prove his father wrong, he forgot the important thing, the reason why he did culinary. Don’t we all sometimes like that? Too much focusing on something else that we forgot why we started that. Now, if you don’t know what you want to read, I would suggest grab this book and read it. Perhaps, you’ll be hungry like I did after I’ve finished reading. Or perhaps, you’ll finally feel like you should do something for your life. And there’s never too late as long as you’re still breathing.